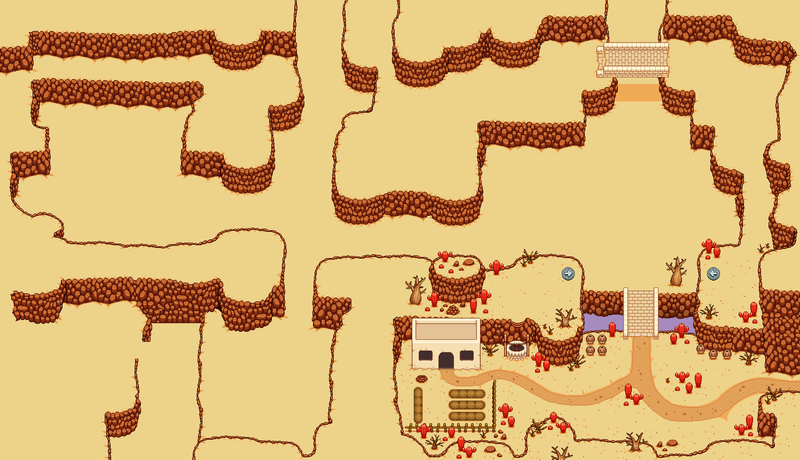 Alright, time to decorate the final desert map (or what has been made of it yet, anyways)! 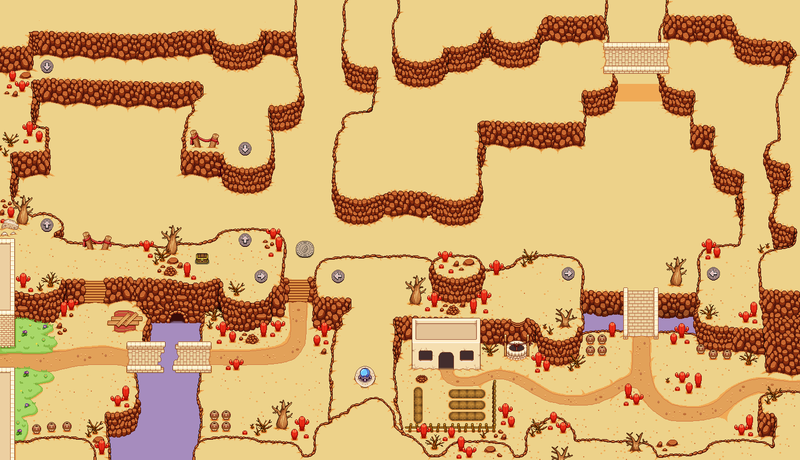 Since I'm sure you all (me included) are pretty tired of these desert maps by now, I'll just finish this up in one post this time. After all, it's not even that big of a map, so whatever! 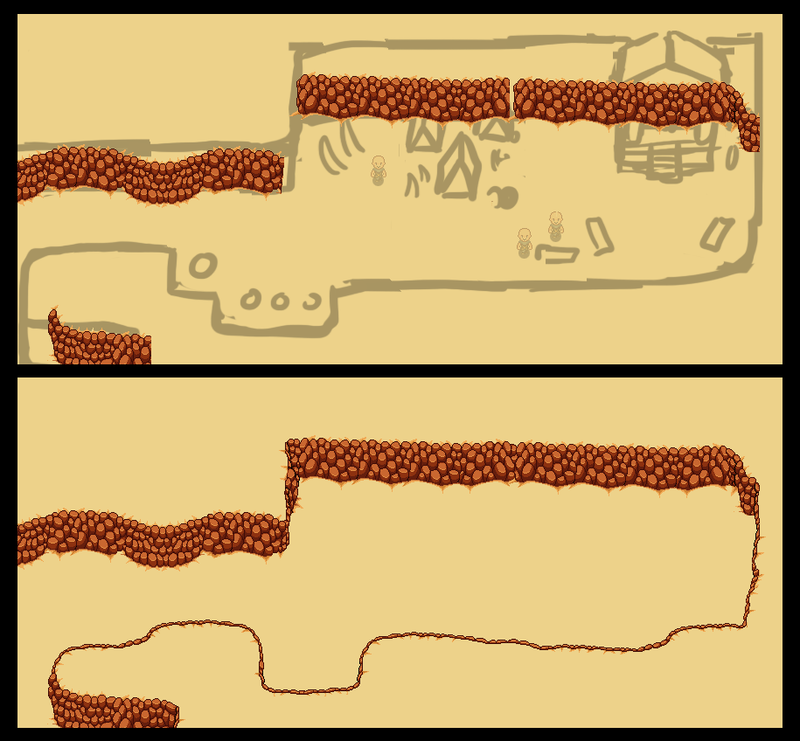 As you can see, I've already gone over the area with a black paintbrush, making rough sketches on top of the original sketch, showing where I want certain decorations to be and approximately what I want them to look like. 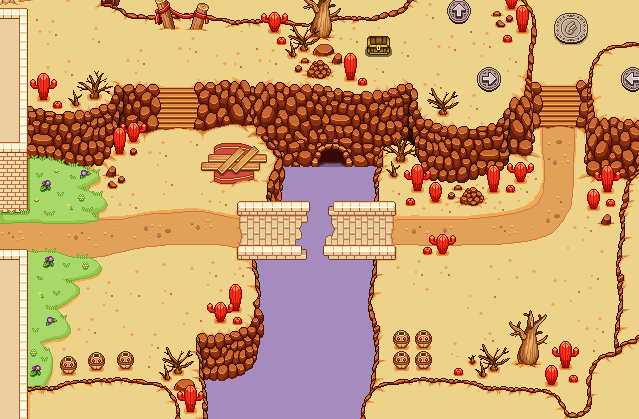 This time around, since we haven't added a whole lot of the map yet (still unsure what exactly the left part of the map will look like), I won't be doing too much rock painting, I hope! 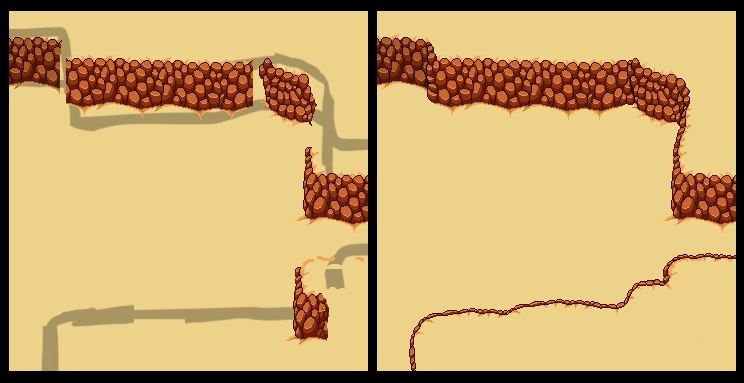 Like with the previous maps, I start off by copying rocks I already completed to places where I think they would fit. 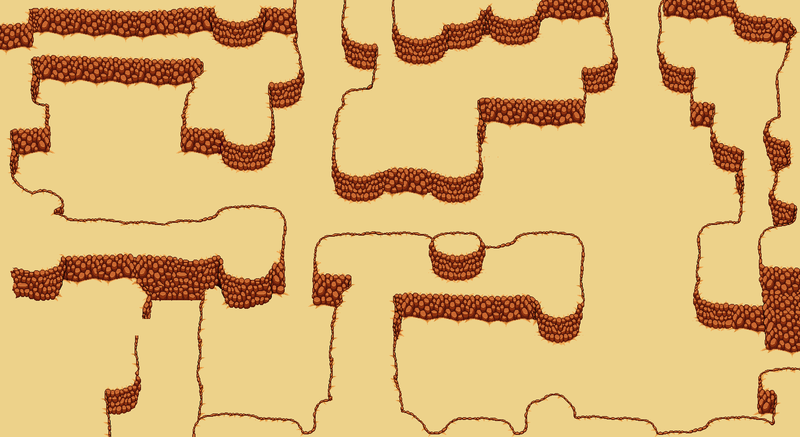 Since this is the third map, it means a lot more of the map is covered with pre-made rocks, and I'll spend more time stitching together these pieces rather than creating huge chunks of the rock walls. Alright, I'm taking a break from item- and hat-making (which essentially is pretty much the same thing for me), and instead I've been creating a new portrait! This character won't appear for quite some time, and when she does, she might not even get cast as the character I intended her to be when I made this portrait... 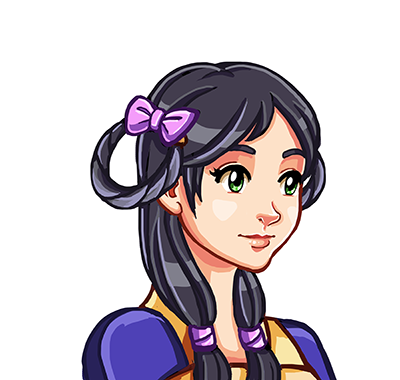 But she also may, and in that case, let's just say she'll be a quite important character you'll encounter when you explore the depths of Mt:Bloom! Other than items & equipment, there's one more thing you can't have too many of: hats! So today I've spend some time creating a lot of new hats for your character to wear. Ever dreamt of being Gandalf, a mighty viking or simply a frail old man? With this large beard, your dreams might come true! What game is complete without a jester? Well, since there ain't one in the game so far, you might as well take the job into your own hands with this jester hat! 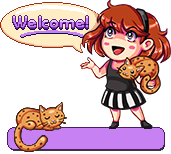 Today I've been working on a bunch of items for you to find in the game! We can't ever have too many items, after all - there are plenty of chests that still don't have proper loot, not to mention we need a wider selection of equipment to suit many different character builds. Most of these are equips of different kinds. Some might be easy to guess what they are, some might be more mysterious. As to where you'll find or how you'll craft these items, nothing has been decided just yet, for now they're just available where we feel we need them the most. 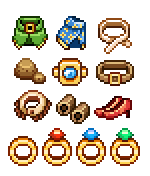 The gemstones above aren't in the game yet, but once they have been added, they will serve as means to give the player some extra money (or perhaps be used to craft things that need to be enhanced by stones, such as rings or certain rods). Each gemstone will be sold at a different price, though we haven't decided exactly how much yet. 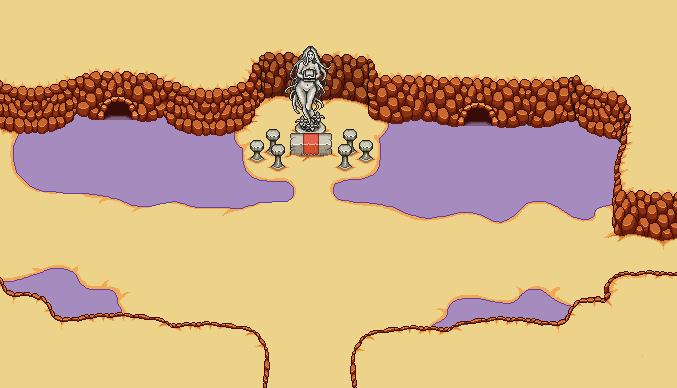 Economy in Grindea is a quite complex subject - we don't want there to be too much money floating around, with nothing to use it for, but we also don't want there to be items nobody even considers buying because money is simply too scarce. I feel this money problem is something that a lot of games struggle with, so it'll be a challenge for us to try to get it right. In the last game I played (Dragon Age: Inquisition) I felt like everything was so dang expensive (at least any equipment that was actually good), that I couldn't possibly afford it, and once I finished the game I had found way better equips anyway, so when I finally could afford the 'great things', they simply weren't good enough anymore, haha! Finally it's time to complete this second desert map! 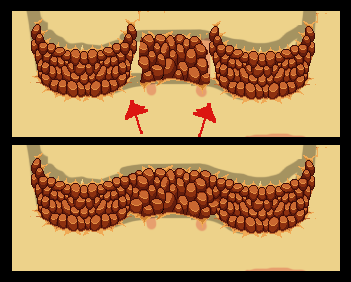 I'll mainly focus on adding tiny decorations in this step, but there's one thing that hasn't been properly added yet: a giant tree that will be in the top left corner of the map! Once that's done, all that's left if to decorate the rest of the area, add more roads, and make sure there's enough room to fight. Then it's all about decorations! 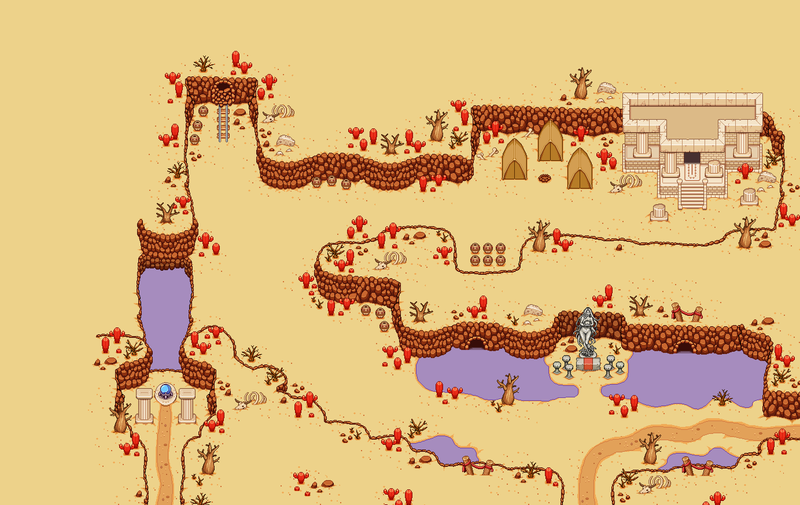 I add more cacti, trees, pottery, you name it... There's also a bunch of wood on a blanked where the guy who will fix the bridge will be standing! 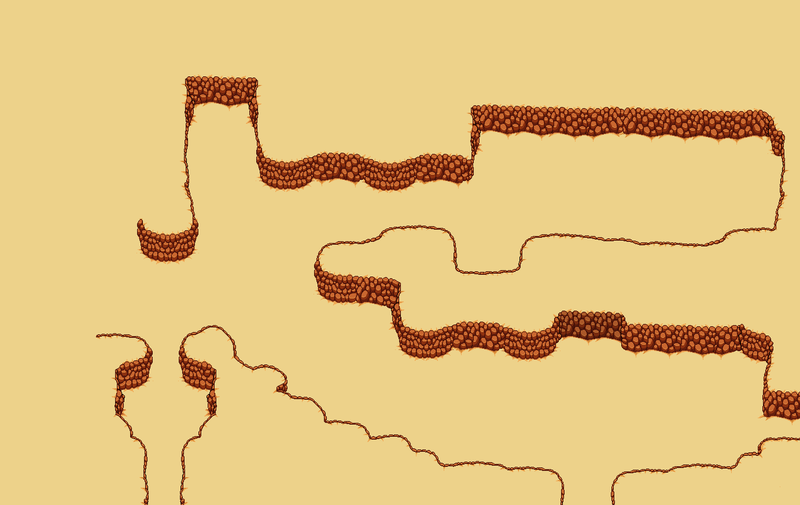 Tomorrow I'll post the third and final part of decorating this desert map, where it'll all come together! 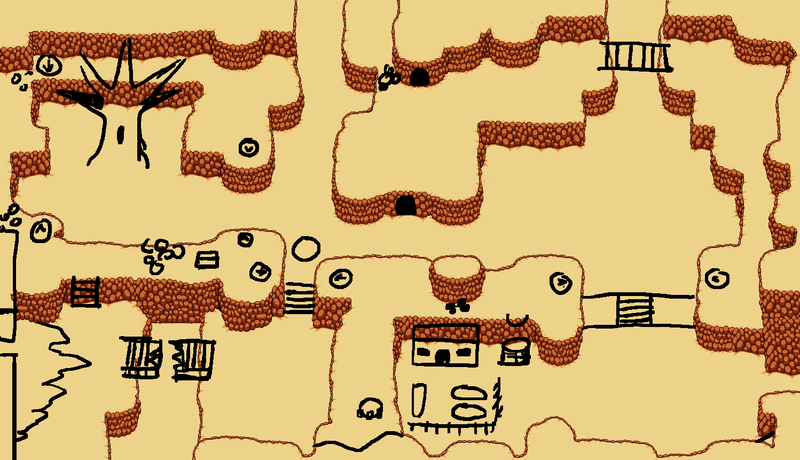 This time it's, of course, Map02 that will have the spotlight. Yesterday we added some walls to the area, today it's time to begin decorating! 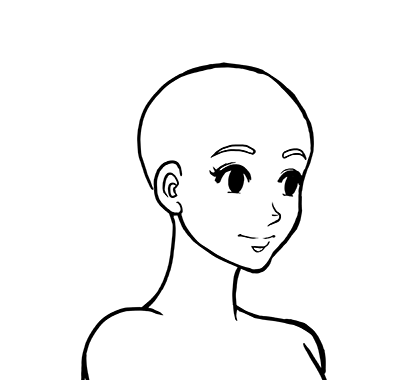 A sketch showing approx. what decorations are needed! Next to the house is a well. 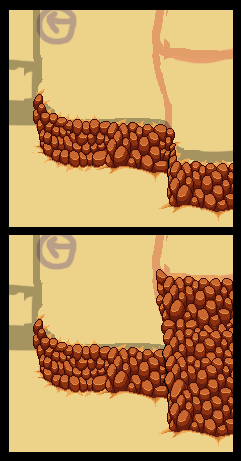 We weren't entirely sure what color we wanted it to be - should it be the same as the rocks, or the same as the house? 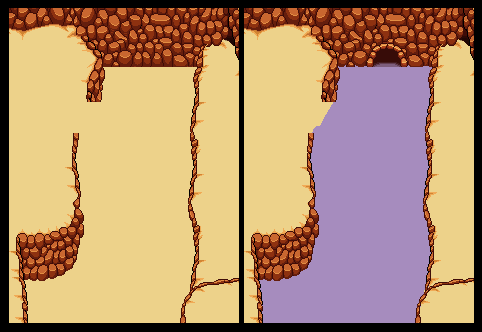 In the end, I began by making it the same color as the rocks, but once I was done I changed the colors around and made a second version matching the house. 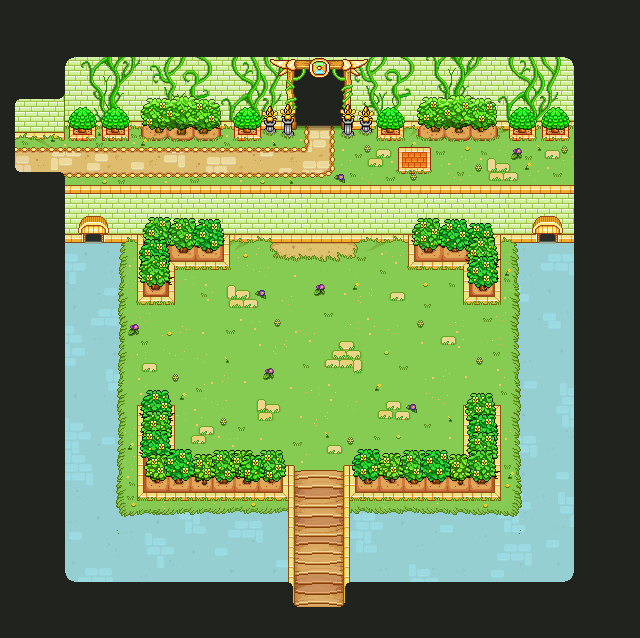 Next thing I began working on was a bridge! 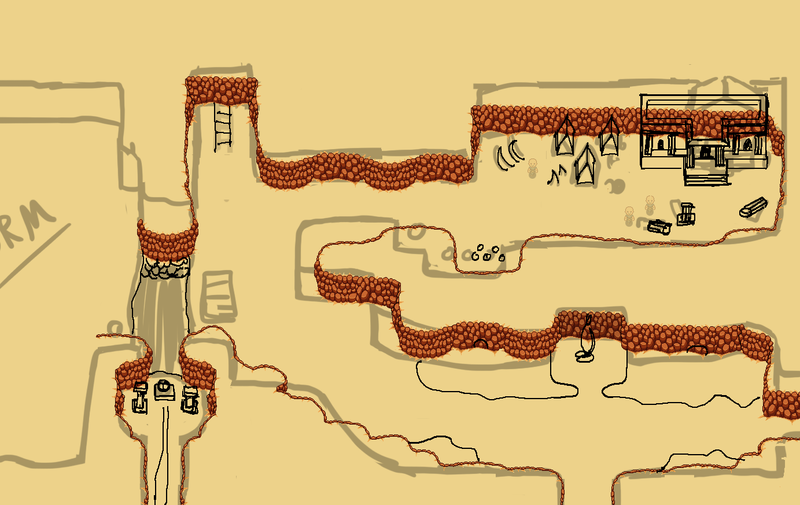 There's gonna be a bunch of bridges around this area, but I started with the on in the top-right part of the map. There's gonna be a bridge next to the house as well, though it may not look like it in the sketch! Above is the map with each premade piece added. 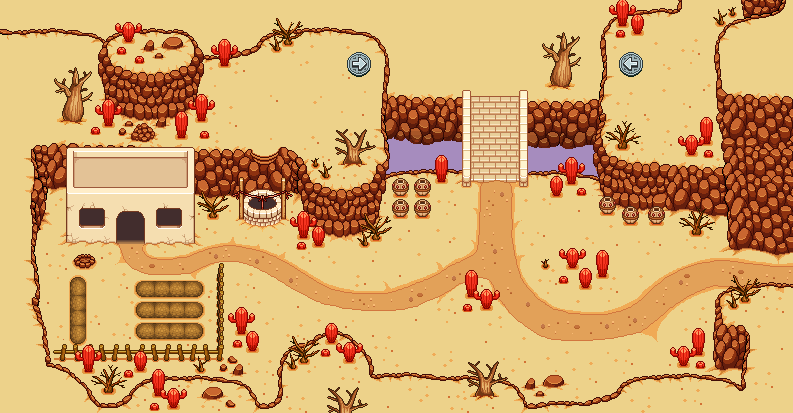 I've painted red arrows wherever I need to fill in rocks. Above is the first major section I worked on! 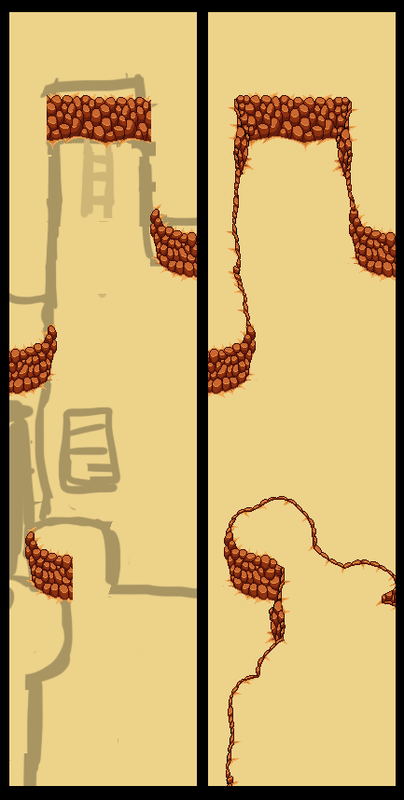 The above screen shows what it looks like before I start editing, the lower one shows the "finished" version. 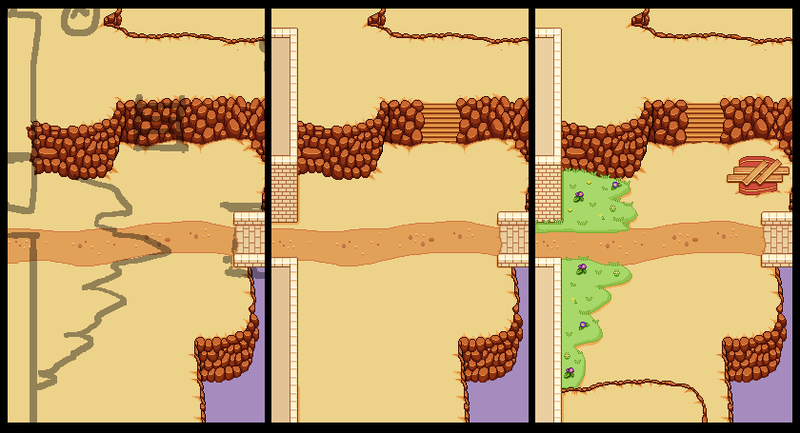 Part of the wall will be above a little stream of water, which is why I made it longer than the rest in the lower part. 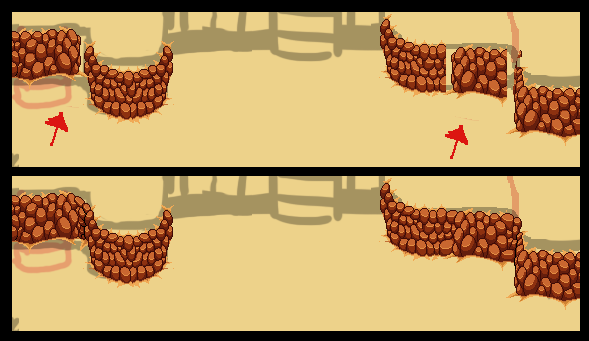 As for the rest, they're really just a bunch of before and after pics, showing you where I've had to build new rocks to connect the pieces that were already made. Enjoy! 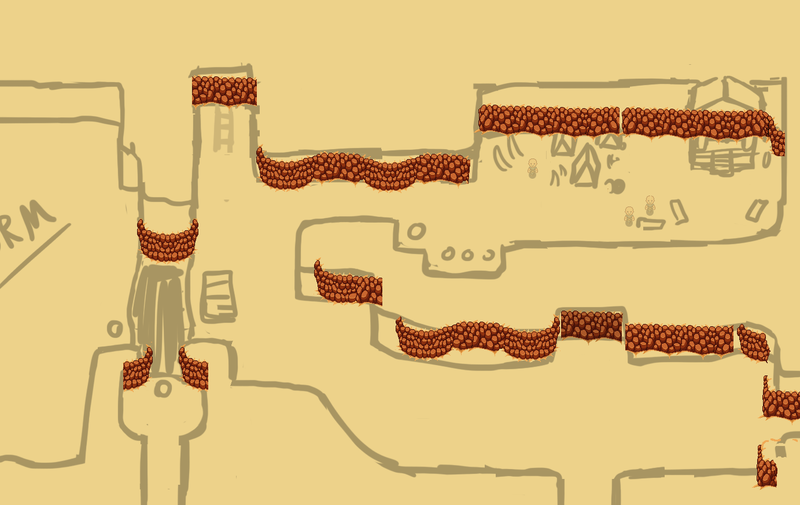 Finished version, showing all the walls of Map02! 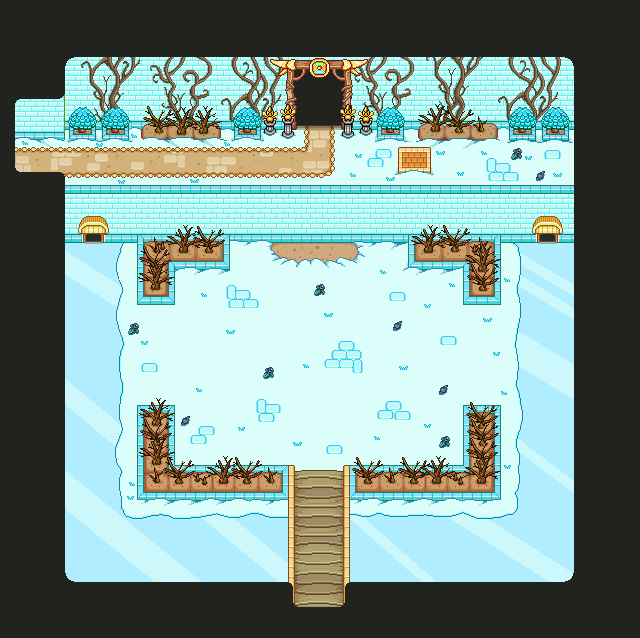 In an upcoming patch, there will be a few changes to the mini-boss room! 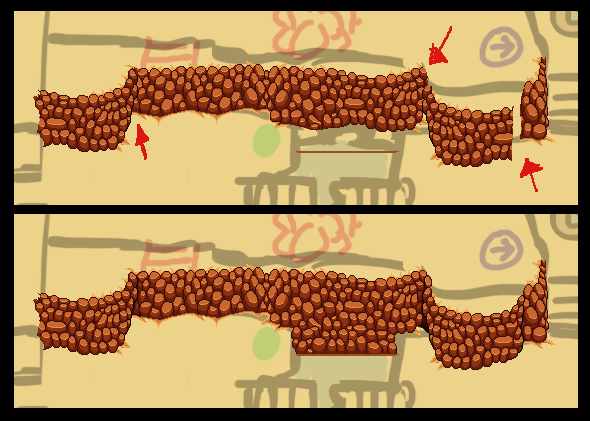 We have mentioned on the forums that we want some way of quick-traveling to the boss in the cases where you should leave the dungeon, so our solution was to add a vine that can be climbed from the mini-boss room directly to the boss room. 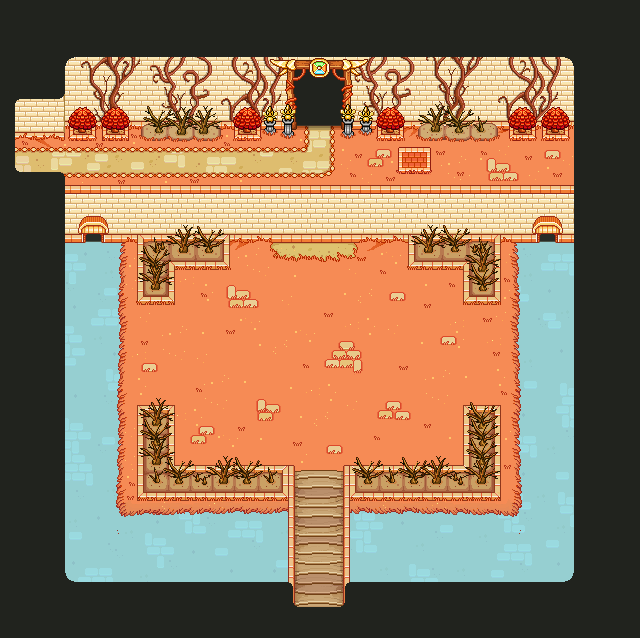 Secondly we needed a third version of the room: an autumn version. 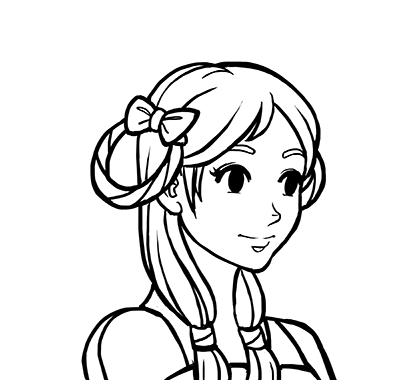 Right now, Elder Summer turns the room into its summer version once you beat the mini-boss. 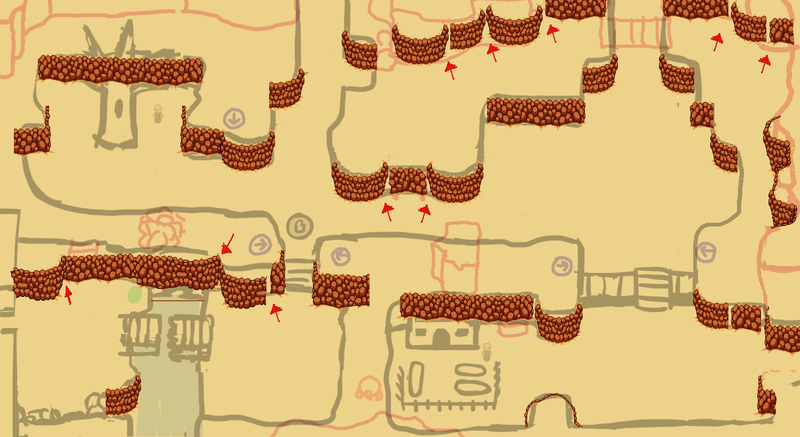 However, with the added vines, that would mean you could climb directly to the boss without going through the dungeon. Items, Equipment, Money, and Books! 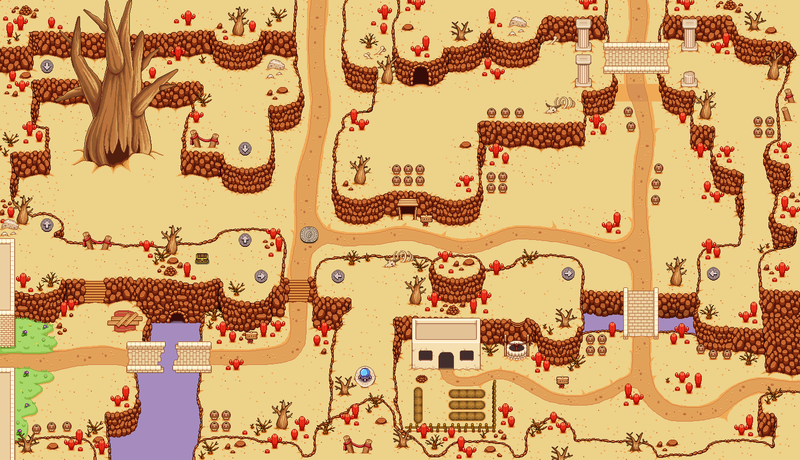 What happens after the Temple of Seasons?